Disclaimer: These updates are still in progress. If you decide to use these with your class please give us feedback on how we could improve by emailing us at sep@fredhutch.org. The ELISA Teacher Guide provides an overview, timeline and prep information including the solutions and dilutions guide as well as aliquot summary. This is the student protocol for ELISA which can be applied to any infection or topic that you're current covering with your class. Build your own scenario by filling in the "patient" information for the "samples" the students will run. Student Data & Analysis sheet for a general ELISA protocol that can be edited to fit many different scenarios. This is a student ELISA protocol that simulates how ELISA could be used for HIV detection. Student Data & Analysis sheet for the HIV ELISA scenario. The world of gaming is colliding with science education - here are our favorite educational games. From the Federation of American Scientists - students navigate a nanobot through a 3D environment of blood vessels and connective tissue in an attempt to save an ailing patient by retraining her non-functional immune cells. You are specialists at the CDC/Atlanta. Several virulent diseases break out all over the world. Your mission is to prevent a worldwide pandemic outbreak, treating hot spots while researching cures. One of many excellent molecular visualizations and tutorials by Eric Martz and colleagues who created BioMolecular Explorer3D. These tools work in a web browser--Chime or other software is not needed. This virtual laboratory demonstrates how a test, termed an enzyme-linked immunosorbent assay (ELISA), is carried out and some experimental problems that may be encountered. By completing this exercise, students gain a better understanding of experimental design, key concepts in immunological reactions, and interpretation of data. Article concerning H5N1 and human-to-human transmission. H1N1 flu resistant to Tamiflu has popped up in a few isolated cases. This kit is a simulated detection of avian flu influenza via an ELISA assay. Students are County Health Officials and are assigned the task of analyzing sera of a bird and a cat via ELISA to detect the presence of avian influenza. 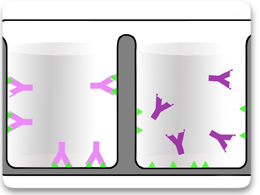 The kit also includes some models for demonstrating how the ELISA assay works and about antibody structure. Additional resources and journals are included to inform and educate students on the impending avian flu situation across the globe. 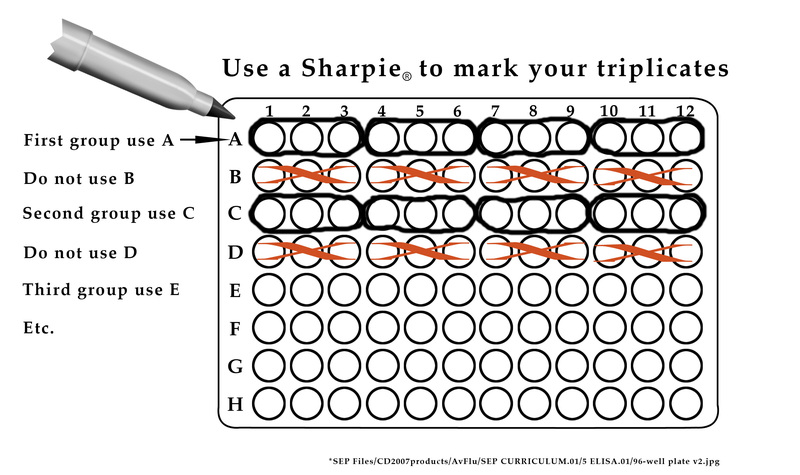 1) Teachers must attend a training workshop to sign up for an ELISA Kit. 2) Teacher supplies distilled water to dilute PBS, paper towels and timers for wash steps. This is the Title Page for the ELISA Notebook. Key attitudes, knowledge and skills students will acquire as a result of this unit. A summary of the Avian Flu curriculum and major topics. Lesson timeline based on 55-minute class periods. Adapted from the BSCS "5E Model". Topics the ELISA Kit covers in the National Science Standards. The initial scenario, introducing students to Garfield, the pigeon, and their research task. A link to the Indiana University's KWL Instruction webpage. Background information on the H5N1 virus - designed for teachers but appropriate for advanced students. Using WHO data, students plot locations of human and animal H5N1 cases worldwide over time. Overhead transparency for the Map Activity. 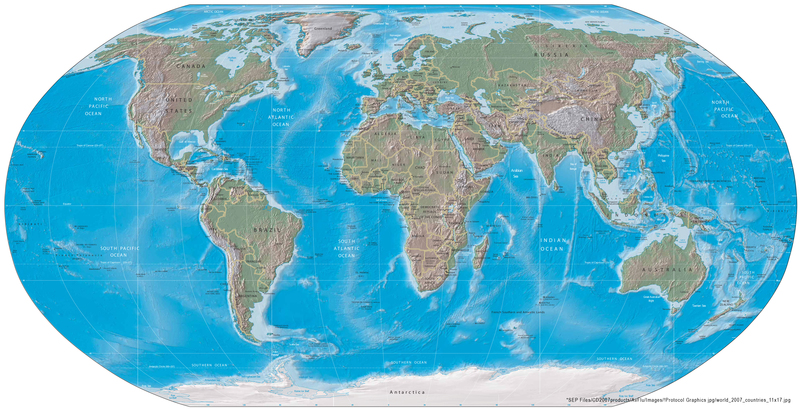 A 17in x 8.5in world map students can use to plot flyways and H5N1 outbreaks. Link the the WHO webpage containing a PDF of H5N1 outbreaks catalogued by year. A tutorial on how to download and use the Google Earth mashup tracking H5N1, created by Nature.com. 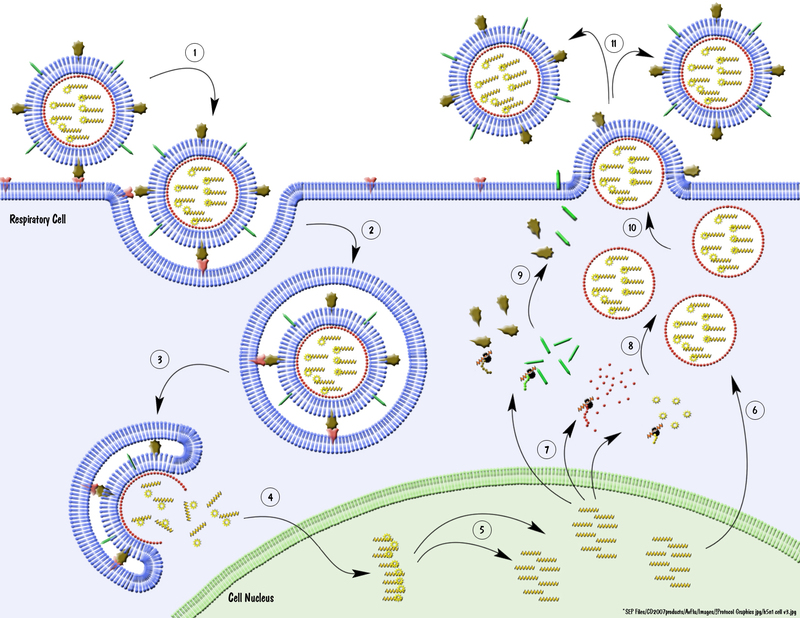 A 2-page graphic showing the various stages in the viral infection of a cell, along with a key of symbols and terminology. A 1-page graphic of viral infection of a cell and key. This link will take you to the Clean Harbors website, which has created a useful dictionary of influenza terminology. This link will take you to the Nature article, covering the immune system, mechanisms of DNA reshuffling, and antibody formation. An activity designed to teach students about the formation of antibodies by building models out of chenille stems. This link will take you to the University of Arizona's website "The Biology Project", an interactive resource for learning biology. They have created a unit on anitibody structure that is very useful. This guide is designed to help you locate any protein structure of interest and download it from the Protein Data Bank. Antibodies are the RCSB PDB Molecule of the Month for September 2001. Hemagglutinin is the RCSB PDB Molecule of the Month for April 2006. 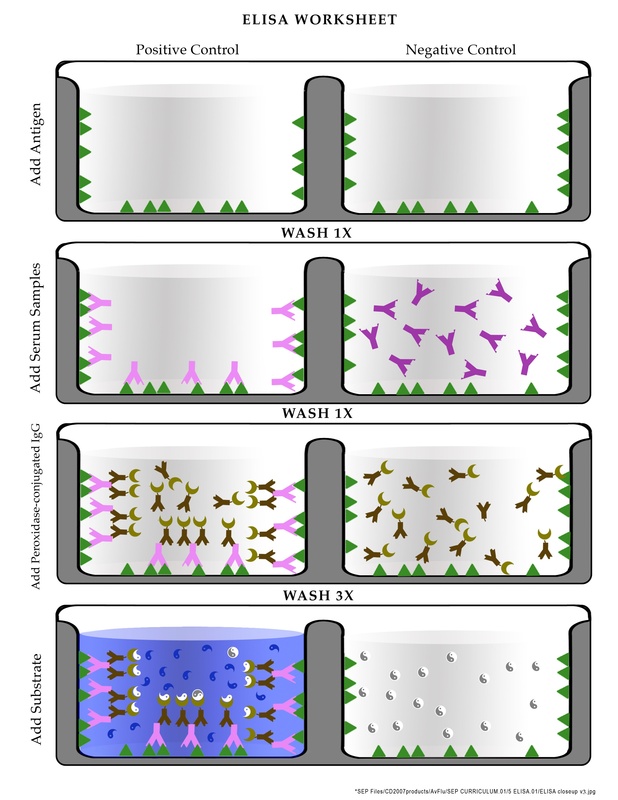 Modeling the concepts utilized by the ELISA assay. Explanation of protocol, dilution procedures, and other information for the teacher to prepare reagents and materials for the ELISA Lab. Teacher's guide to pre-lab questions given to students. An overhead describing how students should label and use the 96-well plates in the assay. 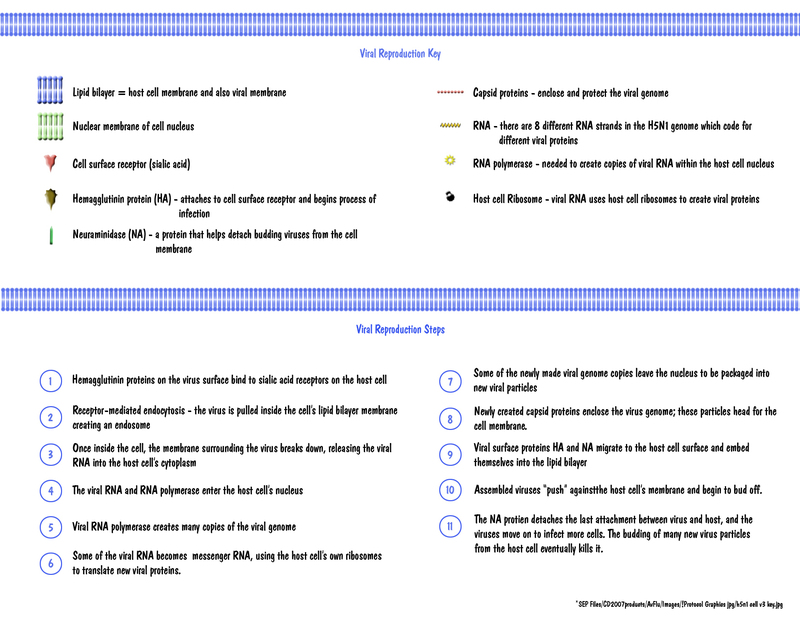 The student protocol for the ELISA lab. A blank worksheet to be filled out by the students describing their results. An overhead teacher's can use to walk students through the ELISA process. A key for the expected results of the ELISA lab. ELISA Rubric - Letter From County Health Dept. Expectations of students' understandings based on their final results and a written letter to a "County Health Department". 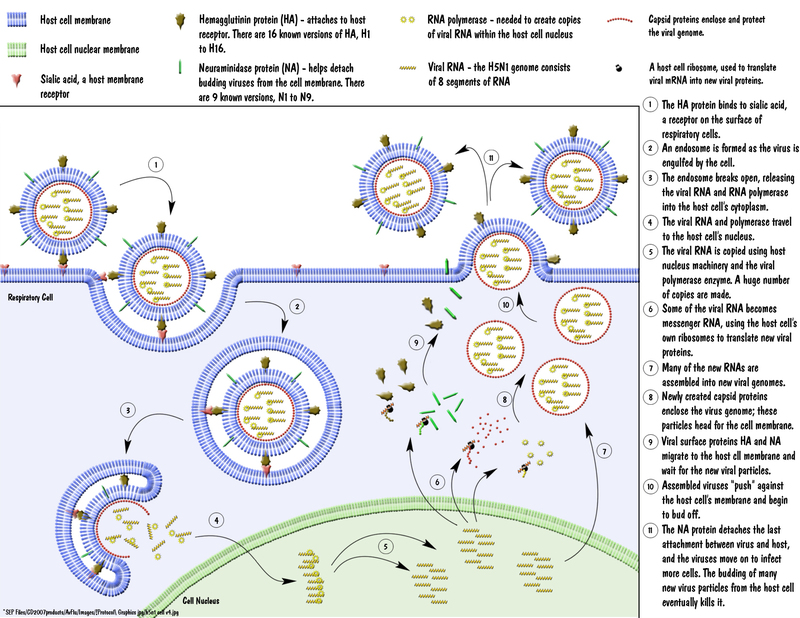 These are links to several websites used to develop the ELISA Kit and are excellent resources for additional information on current H5N1 research. From the NOVA website: "Can we better prepare for future flu pandemics by resurrecting the 1918 flu virus? This microbe, recovered from tissue samples of World War I soldiers, is perhaps the deadliest pathogen in human history. In this NOVA scienceNOW video segment, meet microbiologists working in the trenches to (very carefully) reconstruct a virus that killed up to 50 million people worldwide." The official USDA website on pandemic flu and avian flu. The World Health Organization's website covering avian influenza information. The Center for Disease Control's extensive website on H5N1. Use Gap Minder to explore a world of data and statistics - and its not even boring! Allows you to query for various diseases (such as influenza, drinking water, etc.) with results displayed on a map. Search by health or disease topic, or keywords and select range of geographic coverage desired. These are several links to Avian Flu's "cousin", Swine Flu, which is also a current source of concern for epidemiologists. Swine Flu is caused by the H1N1 virus. On October 12, three of the Hutchinson Center’s leading infectious disease researchers presented a public symposium on H1N1 swine flu. These videos feature Drs. Larry Corey, Ira Longini and Corey Casper. An article from the NCRR at National Institutes of Health concerning the possibile pandemics from H1N1 and H5N1. An article from the NCRR at the National Institutes of Health concerning pandemic planning in third world countries. Google Flu Trends uses aggregated Google search data to estimate flu activity. A Nature article covering the development of vaccines. Links to articles used in the development of the ELISA Kit and important background information for teachers and advanced students. A Nature News article concerning newly identified antibodies. The continual threat of influenza A viruses such as avian H5N1 lies in their basic biology. 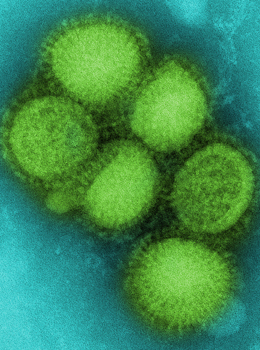 Inﬂuenza virus remains a serious health threat, owing to its ability to evade immune surveillance through rapid genetic drift and reassortment. Recent events, including human cases of avian influenza, have heightened awareness of the threat of a pandemic and have spurred efforts to develop plans for its control.